The data on the industry has been thin and misleading. The Uber app, showing its cars converging on the City Hall area in New York. New York Mayor Bill de Blasio and Uber stepped back from their confrontation Wednesday, a day before the City Council was set to vote on the mayor’s proposed cap to the growth of the for-hire vehicle company and its rivals. For now, at least, the city has dropped the cap idea. But the debate will continue over whether the companies are increasing congestion in Manhattan’s center, and whether they are increasing mobility for people without cars or access to transit. The city will move ahead with a four-month study of the for-hire industry, examining how it has affected traffic, air quality, noise and public health, and Uber has agreed to release data on its business that the city had been seeking. Those numbers may finally shed some light on a growing industry that has been difficult to track. Up to now, the data being thrown around has been contradictory, confusing and in some cases misleading. The mayor’s office says it suspects that Uber is increasing congestion, but it has not clearly made that link. Take, for instance, the city’s assertion of a slowdown in its central business district. From 2010 to 2014, the average speed of vehicles south of 60th Street in Manhattan between 8 a.m. and 6 p.m. fell by 9 percent, according to testimony at a City Council meeting from Polly Trottenberg, commissioner of the city’s Transportation Department. The latest data shows traffic moving at just under 8 mph in May, down by 13 percent from May 2010.1 During the same time period, the number of vehicles entering the area fell by 6 percent. The culprit, the city suspects, is a high usage rate of some of those vehicles, presumably for-hire ones that circulate for longer in the area than the average car does. The data, however, tells a more complicated story. 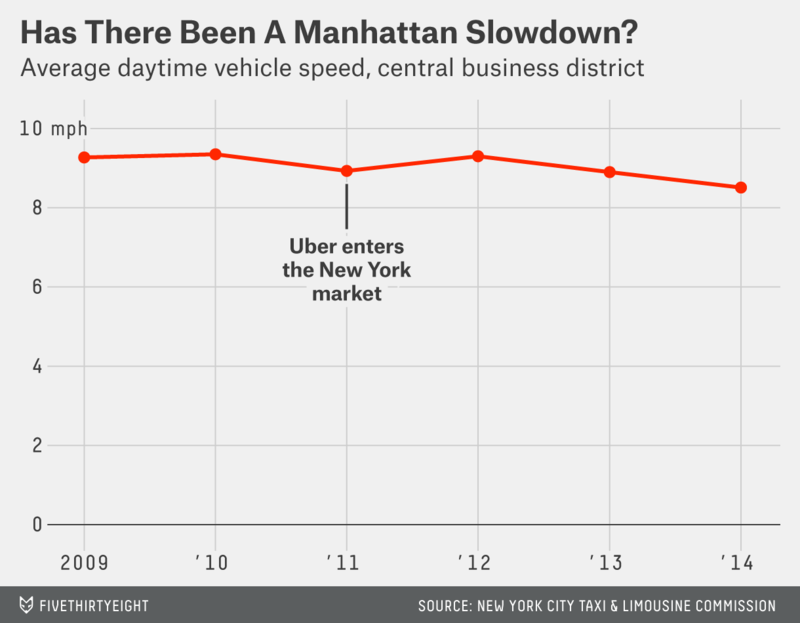 Average speeds fluctuated before Uber surged in New York, rising by 1 percent from 2009 to 2010 and then falling by 4.5 percent the next year, when Uber entered the city. The drop from 2012 to 2014 does coincide with a surge in for-hire vehicles to nearly 63,000 in June, up by 58 percent from 2011, the year Uber entered the market. But correlation doesn’t equal causation. Population was also increasing, and other factors might have played a role. For instance, Charles Komanoff, a transportation economist and an outspoken advocate for less car traffic in the city, says he has noticed that drivers are yielding to pedestrians more often than they used to. Komanoff, who created a widely praised model of traffic in the city, thinks the increase in for-hire vehicles has contributed to the slowdown. He estimated the number of additional hours for-hire vehicles were on central Manhattan’s roads because of Uber and other app-based companies. 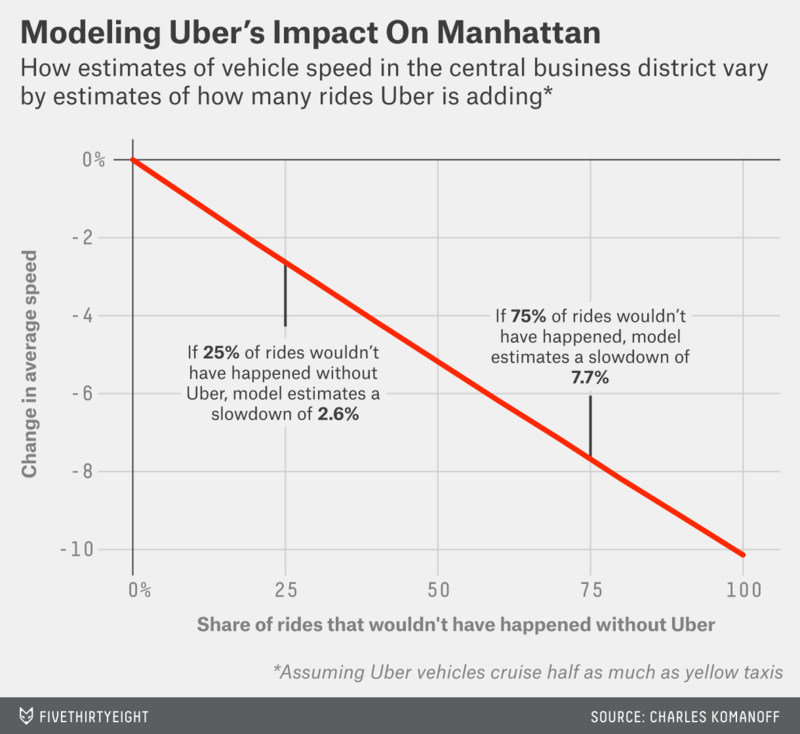 Then, using his model, he calculated that they could have decreased average speeds by 6.7 percent — if each of their trips were a new trip, rather than one that would otherwise have gone to a taxi or other vehicle. He updated the numbers on Wednesday, using data released by Uber that gave more details on its pickups. He calculated a slowdown of 7.7 percent — this time, with the big assumption that 75 percent of rides wouldn’t have happened otherwise. He said if he’d assumed instead that all of the Uber rides replaced taxi rides, then they wouldn’t have contributed to congestion. They might even have reduced congestion, since Uber drivers likely cruise for passengers less than taxi drivers do. It’s also hard to say how good the results of Komanoff’s model are. Komanoff lacks the data to regularly test his model’s accuracy, and he isn’t competing with many other public modelers who could all push each other’s work. “I’m where Bill James was in 1982,” he said, comparing himself to the pioneering baseball analyst in his early days. The data Uber cites to make its case also is murky. In response to Komanoff’s analysis, Uber pointed to other factors that could have affected traffic speed, including what it said were 366 miles of new bike lanes in the city. It’s unclear where that number comes from. Transportation Department reports show only 177 new bicycle lane-miles between fiscal year 2011 — when Uber debuted in New York City — and 2014. Neither count shows how much of the growth came in the central Manhattan area. Whatever the number, Komanoff — who mostly bikes around the city and has spent years as a bike activist — doesn’t think bike lanes can explain most of the slowdown. His model suggests that the most they could account for is a 3.5 percent decline in speed — and probably less, because often new bike lanes in crowded corridors narrow car lanes but don’t eliminate them. Kleiman recently conducted a study that addresses the other central question in the New York City debate: whether Uber and its rivals help people get around in poor urban areas, and in ones without good transit options. The study, though, was of Los Angeles, not New York. Kleiman and colleagues at Botec Analysis Corp., a private company for which Kleiman is chairman, published research this week showing that UberX cars — cars owned by Uber drivers — came to low-income L.A. neighborhoods twice as quickly, and charged half as much, as taxi services. Unfortunately for New York policy analysts, Los Angeles has a different layout than New York. Several of the neighborhoods studied were close to downtown L.A., while riders in New York’s outer boroughs generally have the toughest time getting cabs. Also, Uber funded the study. Kleiman says he’s confident that Uber didn’t game the results, because for most of the study period it didn’t know which neighborhoods researchers were using. He cautions, though, that Uber could fund other research and not publish it if it’s less favorable to the company. Nonetheless, he thinks he’d find similar results elsewhere, and pointed out that the researchers approached Uber to suggest the study. “I would love to see legacy taxi companies fund this,” he said in a telephone interview. Just how much the new entrants in New York are serving outer boroughs is another area of data confusion. Meera Joshi, head of New York City’s Taxi and Limousine Commission, said nearly three of four trips taken by users of Uber and other new operators originate in the Manhattan core, which is all of the island south of 96th Street on the East Side and south of 110th Street on the West Side. Uber on Wednesday released data showing that 52 percent of the company’s pickups since June 1 were below 60th Street in Manhattan — not an apples-to-apples comparison. David Mack, director of public affairs for Lyft, Uber’s chief rival in the app-based market in New York, said 40 percent of its rides never enter Manhattan and two-thirds start or end outside the borough. Uber told Newsweek in December that its riders in outer boroughs wait a median time of three minutes and eight seconds. An Uber spokeswoman said the average wait is “under four minutes.” That also could reflect how long Uber users are willing to wait, as it excludes cases where would-be customers decide not to take the ride. Uber has a track record of selective release of data to the public and to the cities in which it operates. Last week, an administrative judge in California recommended suspending the company from operating there because it wouldn’t share certain ride data. In New York, Joshi said Uber and its rivals could speed up the proposed study period by sharing data on their fleets’ traffic circulation and helping the city survey drivers and riders. An Uber spokeswoman said the company currently shares the time and location of the start of trips — but not the end or points in between. There’s also reason to question Uber’s claim that the cap — which the city says it may still impose — “would destroy 10,000 job opportunities” by preventing 10,000 drivers from signing up for Uber. An Uber survey of its drivers in October showed that 42 percent in New York City work 15 hours or fewer per week. “Careers have become part-time jobs,” Ethan Gerber, executive director of the Greater New York Transportation Association, a yellow-taxi industry association, said in testimony to the council. Even if curbing Uber’s growth helps traffic get back to speed, many have pointed out that other steps would reduce congestion more — and so far the mayor hasn’t backed one prominent proposal to do so, called Move NY, that would use tolls to discourage driving in the core and reduce traffic. Uber hasn’t taken a position on the plan but is pushing its carpool service as another way to cut congestion. Lyft has its own. Both services might get more users if the city does decide later on to force a slowdown in the industry’s growth. CORRECTION (July 23, 6:25 p.m.): An earlier version of this article incorrectly described Manhattan’s core. It is all of the island south of 96th Street on the East Side and south of 110th Street on the West Side, not all of the island south of 60th Street. The average speeds are based on GPS data from yellow taxis.